Celebrating 8 years of bear making! Happy Anniversary wishes to Tyler Crane of Teds n’ Such. He started making bears when he was thirteen years old. Now, at the ripe old age of twenty-one, this Ball State University student, who’s studying computer science, has been making a name for himself in the teddy bear community. December marks his eighth year in the teddy bear industry. Pearl - soft and cuddly with purple bow. When Tyler was young, he used to collect stuffed animals and Beanie Babies®. “There came a time when I became interested in how they were made,” began Tyler, “so I investigated and found a simple pattern, a small bear at my local Wal-Mart. My mother taught me to sew and helped me with my first few bears. From there I bought a book on designing teddy bears and began making my own patterns.” Being mainly self-taught designer, he gladly takes helpful hints from teddy bear artist-friends he has made in the teddy bear industry. Ozzie will win your heart! Starting as ‘Tyler’s Teddy Bears’ and with the support of his family and friends, Tyler began selling his original creations at a local craft show. With his computer knowledge he created a website and uses eBay to get his creations into the hands of collectors. His company eventually transitioned into ‘Teds n’Such’ since his creativity included other animals too. “I like to try new fabrics and ideas,” Tyler said. “Last year I made an ostrich, which is not an animal that someone would normally make, but I did it anyway!” Tyler explains. “I try to make different kinds of bears and animals so any collector can see, appreciate and fall in love with them.” That is surely the case with his mixture of traditional and whimsical styles. 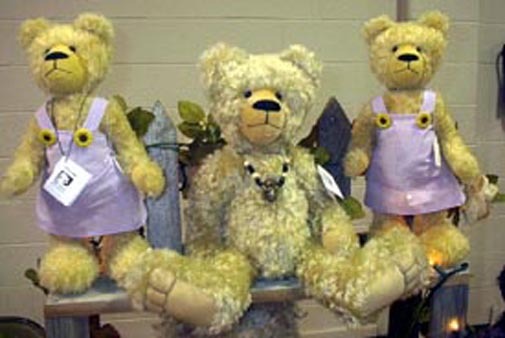 Traveling from his home in Indiana, he enjoys selling at teddy bear shows mainly in Indiana, Ohio, Michigan and Illinois. “Bear shows have turned out to be my favorite venue for selling because I enjoy traveling and meeting new collectors,” Tyler began. “People can get a hands-on idea of what my bears are like. There is nothing like being able to pick up a teddy bear in person and feel how cuddly it is.” With his mother, Cindy and good friend, Zac Davis, helping with sales and coming up with additional ideas, Tyler is working to make his bears and buds appeal to every collector. Tyler's bears always smile at you! I think we can share the sentiment. We are glad you are here too, Tyler. Happy anniversary! Plumkin - shown to the left. A rich plum colored mohair bear. Firebolt - one of Tylers' other critters! Shawnna in rosy curly mohair. Cindy, Tyler's mother is very proud of her son's accomplishments. Tyler has been featured on various websites as Artist of the Month and has appeared in Teddy Bear Review, Teddy Bear and Friends, and is a Professional Member of BearsandBuds®. Tyler's colorful 'Markus' Teddy Bear won placement on Bright Star Promotion's collector's invitation postcard. The bear photo was used in newspaper advertising too. During the Indianapolis Teddy Bear Show, Tyler was presented with a Winners Certificate and congratulations from everyone!